There are so many global positioning systems (GPS) out there from high-accuracy, heavy-duty units that cost thousands all the way down to completely free smartphone applications. 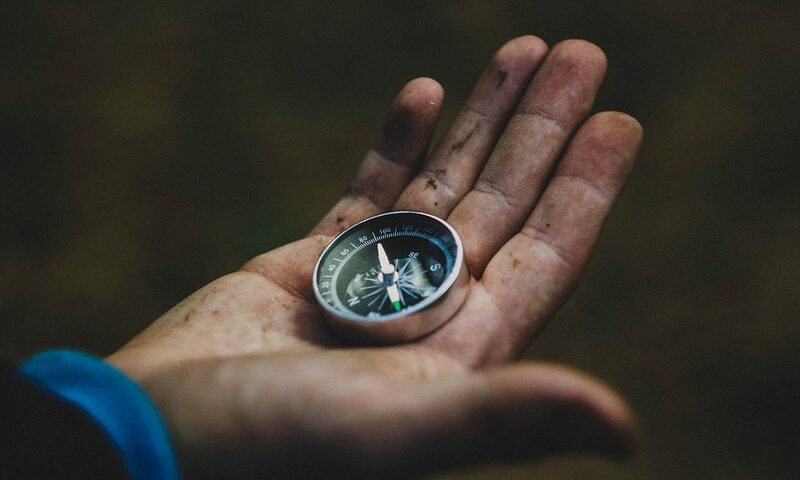 In this age of technology, many may wonder, “who needs a compass anyway?” But the truth is that knowing how to use a magnetic compass can still be a very useful skill to have in your quiver. A compass is superior to a GPS unit in many ways. It is small, lightweight, cheap, needs no power source, apart from the magnetic field of the earth of course ;-), and can be used even under thick cloud cover, tree canopy or other situations where you can’t see the sky and therefore may not have access to GPS satellites. That being said, of course, a magnetic compass still has a couple of drawbacks. Namely, the requirement to develop skill in order to use it effectively, and the possibility of disruption by other nearby metals (we’ll go over how to account for this later). However, developing the skills to use a compass is not too difficult to do and is very satisfying once mastered. In this article, you will learn what features to look for in a compass, get an introduction to declination, learn how to take and follow a bearing in the field, and learn how to avoid false compass readings. Before you can learn how to use a compass, it is necessary to make sure to choose a compass that will be useful to you in your two-foot travelling pursuits. There are many varieties you can find, and some will either be too complex or too simple. If your compass is missing any of these features, you will not be able to use it effectively to navigate in the backcountry. You can find a good compass with all the necessary components for around $20. I use a Silva Polaris. Silva is a good brand that makes many different compasses. A beginner compass like this Silva Starter has all the necessary bells and whistles and is an excellent value for the price. You may also want to purchase a compass with adjustable declination like this Silva Ranger or this Suunto MC-2. This raises the price tag up to around $50, but if you are planning on doing a lot of compass navigation it may be worth it. If you don’t want to shell out an extra 30 bucks, don’t worry, there are ways to use a compass without adjustable declination just as effectively. So what’s all this I’ve been hearing about true North and magnetic North? You may have heard the terms, true North and magnetic North and wondered what the difference between them is. Well, the short answer is that true North is the top of the globe or the north pole. And magnetic North is based on earth’s magnetic fields. Magnetic North is the place the needle on your compass actually points to. So don’t follow it expecting to find Santa’s house. 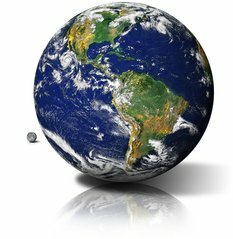 The difference between true North and magnetic North is called the declination and depends on where you are standing on the earth. This is all further complicated by the fact that magnetic North fluctuates and changes over time and by extension, so does declination. The declination of your hometown today is different than it was 5 years ago and different than it will be in five years time. If you have a good topographic map, which is one of the survival essentials, it will list the declination at the bottom, however, if your map is old it will likely be a little off. Luckily, you can use the NOAA Magnetic Field Calculator to find the current declination anywhere on earth. So does all this declination stuff really matter, and is it relevant to you? The answer is yes and no, it depends on what you would like to do with your compass. If your buddy gives you a direction to follow that will lead you to a hidden cave from your campsite and uses magnetic north without adjusting for declination, then you don’t have to adjust either. But if you want to start doing anything much more complicated than that, like orienting your map so that it matches up with the actual land features for example, then you need to know how to account for declination. There are a few different ways to adjust for declination. One of them is to purchase a compass with the ability to adjust built in, as discussed earlier. Another option is addition and subtraction. And the third option is to just use a wet erase marker to mark the declination on your compass. We’ll talk more about when and how to account for declination, as well as how to use a compass with a map, in a later post. There’s a lot to learn about using a compass, so in order to avoid getting overwhelmed with everything all at once, for now, let’s just start with the basics. What in the world is a bearing? A bearing is a precise description of a direction. If you take a look at your compass you’ll see a dial around the circumference of the housing printed with the cardinal directions, North, South, East, and West. This is called the rotating bezel or the azimuth ring. 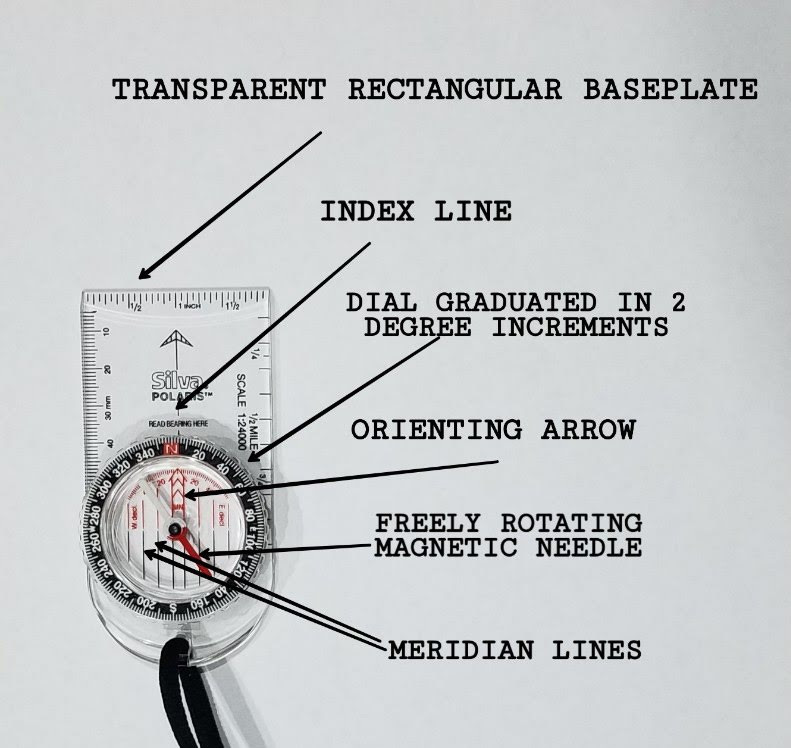 On the bezel outside of the cardinal directions there are 360-degree markings, and if you chose a good compass these should be measured in 2-degree increments. Basically, a bearing is a degree measurement of direction. So a bearing of due south would be 180 degrees. You can use bearings to communicate a precise direction you want someone to follow. Let’s say your friend is off on a backpacking trip to your favorite area, and you want to tell her where the best campsite is. If you can give her a landmark to start at, a bearing to follow, and a description of where to stop, she will be able to find your campsite. The process of taking and following field bearings is relatively simple and a good starting point in learning to use a magnetic compass. So let’s try it. Did you know that the red portion of the magnetic rotating needle on your compass has a name? His name is Fred. And it’s important to get red Fred into his red shed, otherwise known as the orienting arrow. When you want to take a field bearing begin by holding the compass flat in your hand and pointing the direction of travel arrow (the big arrow at the top of the compass) toward a landmark in the desired direction. 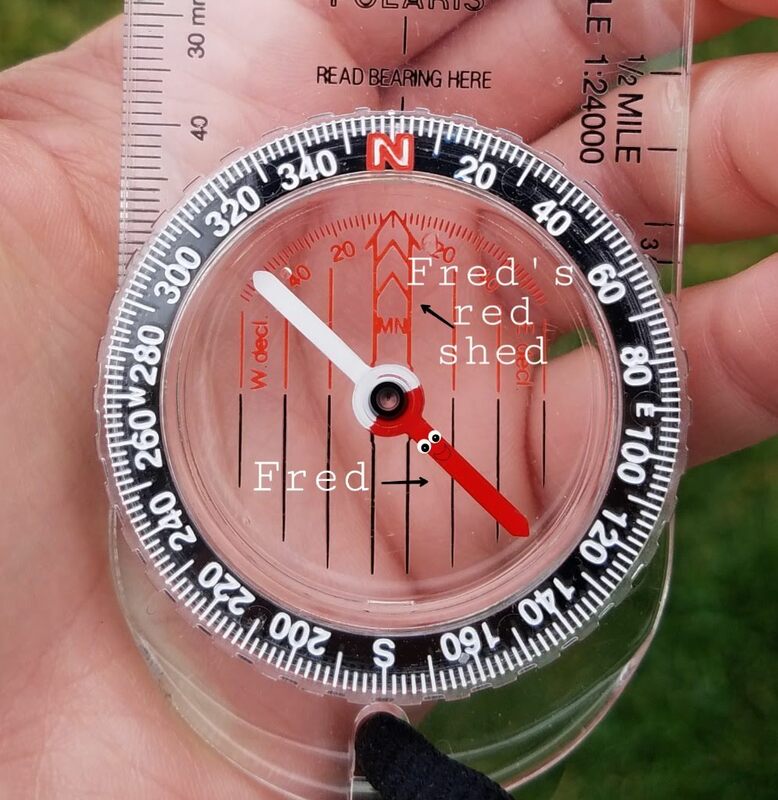 Then, without moving the compass body, rotate the bezel until the magnetic needle is within the orienting arrow, or in other words until the shed meets Fred. Once Fred is inside his shed you can read the bearing at the index line. It’s that easy! You can combine multiple bearings and landmarks to give someone precise directions to a desired point. Just remember that any bearing is relative to where you are standing. If your friend tells you to follow the bearing from the ponderosa pine and instead you start from the firepit, you won’t end up in the right place! 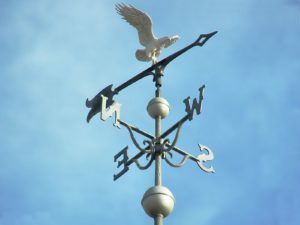 Because a compass works via the attraction of a small magnet to the magnetic field of the earth, metal objects may deflect the magnetic needle resulting in false readings. It is important to keep this in mind while you use your compass. For example, don’t hold the compass with the same hand as your wristwatch. Other metal objects to avoid include cell phones, keys, power lines etc. This is also why your compass will probably not be accurate indoors as there are likely many metal objects within your home and any other buildings you may be in. Many rocks that are found in nature are also magnetically active. Some parts of the earth are so filled with these rocks that they create a magnetic anomaly or a place where your compass will absolutely not work. There are magnetic anomalies in many parts of the earth including the Kursk area of Russia, Mt. Jim in Australia, and the lava flows of the El Malpais in New Mexico. These areas are well documented, however it is possible that you may come across a local magnetic anomaly in your travels. The anomalies that you encounter will likely have a small enough influence that they shouldn’t disrupt your bearing for long. However, it still pays to be wary of them. The solution to this problem is to frequently check the consistency of your bearing along a transect or line. To do this identify two points (such as tree’s or features) that are lined up straight in front of you. Take a bearing with the two points lined up, then walk forward several feet straight towards your points (at least 100-150 yards). Take another bearing with the objects still lined up. Congratulations, now you know how to choose a great compass, and use it to take and follow field bearings effectively. This is an excellent start. There are a few more compass related skills you need to learn before you’re ready to throw out the GPS and go compass-solo in the wilderness. So don’t forget to practice. You can practice in a city park or even your backyard. You can even practice with a friend and give each other bearings to follow. You can even practice taking bearings along a transect to check for a magnetic anomaly. (Who knows you may find one) Once you are confident with your field bearing skills, you will be ready to move onto the next steps. Check out this post to learn about reading a topographic map. And stay tuned for a post on how to use a compass and a map together, coming soon. You can also refer to this excellent REI article for further reading in the meantime. Soon you will find your newfound compass skills beginning to serve you well as a great backup to your GPS unit and you will even be able to navigate entirely by compass and map alone, in no time. As always if you have any questions or comments please feel free to contact me or leave a comment below. This is a great article since I’m kind of a newbie in those facts. However, I really have to learn it soon, since my wife wants to take me on a hiking trip, and I have no idea what is where. I will save your post and when we go out to shop, I will open it and choose the right compass for us. Thanks for this post, it will really help me! These compasses will always be needed. Thank you for this. GPS’s are nice but they do run out of power, the same with smart phones, and some compass apps are not true GPS they rely on triangulation for the cell towers, and if there’s no Cell reception, your done. Also, if, for whatever reason, you want to go ‘off the grid’ a compass and paper map is the best way to know where you’re going. I didn’t know that some compass apps rely on cell service. Yet another reason to have a true-to-life compass, at least as a backup. Fantastic article. I learned how to use a compass in the boy scouts, but it’s been a long time since I’ve used one. I’m going to purchase a compass and put your information to use and relearn it. One huge thing you hit on that many in this day relay on phones and technology. If we lose that you have no way of finding your way around in say a disaster. I had always heard the term bearing and had somewhat of an idea what it meant but reading your article I know now exactly what it is. I would say I’m still a beginner so would you recommend I just start with the silva starter then move up to the next one? I really enjoyed reading your article and will be returning for more articles. Compass navigation is definitely a skill that you can easily lose if you don’t use it regularly, but I’m sure it will come back quickly if you start practicing. The Silva starter compass has everything that you need to navigate effectively. It may be good to start with it because it is uncomplicated, and won’t distract you with any extra features. However, if you know you are going to want one with adjustable declination down the line, I think you will be fine purchasing one of the more advanced compasses right off the bat. In any case, it doesn’t hurt to have more than one compass. I’m glad you enjoyed this post, and I hope you will come back often and find more information useful to your own Two Foot Travelling. I have articles about how to use a compass with a map and reading topographic maps, in the works. Great info to know. You do a great job at keeping things really simple and precise! Thanks for posting this. I think you and your son will enjoy learning compass navigation together! I hope you pick one up and have a good time practicing before and during your campout. Thanks for the really useful article on using a compass. Along with map reading, it’s a skill I learned years ago, so even with all the GPS around these days, it’s a useful backup. I did a lot of sailing as well and also learned how to read charts. Many people don’t realize that magnetic North and hence declination changes over time, and you covered that point really well. The points you made about false readings were excellent to bear in mind and I wouldn’t have thought of all of them – cool. I’m glad I could inspire you to brush off the old compass! Magnetic anomalies, bearing, hmmmmm am I in trouble for not knowing these things? Am I in greater trouble if I don’t want to learn them? When I was studying Geography in secondary school, I dreaded this topic with all my heart. LOL. Good for me my exam results-oriented my studies to something completely different. You write like someone who teaches the topic. So many details and complications explained. This is a great resource for travelers indeed. Perhaps someday I will take this compass thing seriously. Thanks for sharing. I hope you will give compass navigation a try again. It’s really something that anyone can learn and I know you can do it! I am working on a video tutorial to help explain things a little easier, so stay tuned for that. I am interested in using a compass, maybe if some day I get lost I will be able to follow north and find civilization again. haha. On the other hand, with today’s technologies functioning on batteries, it is better to have a mechanical alternative to a GPS or Smartphone. Using a compass is a technical skill but anyone can learn to do it! I hope you will give it, as well as Two Foot Travelling, a try. I want to thank you because information like this is useful for everybody… I mean it’s always a good idea to have at least basic knowledge on how to use a compass and know what to do in case your phone or GPS dies while you’re in the middle of nowhere… I say this because once I was in a situation like this while going “into the wild”… after this incident I promised myself to go so “deep in the woods” only when I learn how to use a compass and a paper map. I’m still learning but little by little I’m getting the hang of it, and I can now go further without the fear of getting lost. Once again, thank you for all that valuable information,Nick. I’m glad you made it back safely! I’ve got articles on how to read topographic maps and using a map and compass together in the works. I hope you will come back and check those out when they’re complete! I have to say, I love your website, this isn’t my first visit and won’t be my last. My wife bought me a magnetic compass for Christmas 2 years ago and I have yet to figure out how to use it. It’s been on my to-do list, but just haven’t done it. We do a lot of hiking in the desert mountains here in Arizona, and I really need to know how to read a compass. Every year people get lost in the desert, or on a trail and have to be rescued. I love your super helpful instructions and I am going to bookmark this page so I can make a point to learn how to navigate myself out of trouble if necessary. I do have a question, is there anything that can cause interference with magnetic compass? Thanks again for this article and I look forward to hearing back from you. Yes! The 2nd to last section of this post (titled ‘False readings and magnetic anomalies’) addresses that very question! A little thing like a compass could be the most important little gadget that you could ever get. Something so small could be the only thing that you need to save your life. Many years ago when my father and I would go in the back country and go fishing he taught me how to use a compass. I have never got lost or needed it to save my life but until this day many years later I still carry a compass and still know how to use it. This is a well written article that anyone going into the bush should read. Wow I just know that most compasses point north, didn’t know that magnetic and true north are two different things! What would happen if I use follow the arrow to go north and not use the bearings though? Are the differences huge and I’d get lost without proper bearing, or will I still get to the same destination, only a few miles different? Solid information on using a magnetic compass. Relying so much on technology, we seem to have lost some of the basic survival skills we need. Cell phones can be lost, damaged, no reception or have a dead battery and there (wherever there may be) we are. At least with a compass and the skills to use it, the cell phone can be safely put away until needed. You have provided some great tips and techniques to use making the compass work for you and some strategies on making the learning fun for the younger ones. Thanks! Exactly! Many people use technology for navigation and there’s nothing wrong with that as long as you have a backup and know how to use it! l have always seems these magnetic compass only in movies and I always wondered how they are being used. Looks like I found the exact article I needed to in order to learn about it. This article just taught me how to read a magnetic compass step by step and in a easy way. I should really thank you for helping me with this. Glad the article was useful to you! Thanks for reading. Travelling has become a simpler task as satellite navigation and Global Positioning Systems have taken a position on shelves in stores. These magnetic compasses are sophisticated than floating needles but work essentially the same way and they have a magnetized pointer mounted on a very low-friction pivot that is sealed inside a small plastic cylinder filled with liquid. Before using a magnetic compass we obviously, need to know how to use it. It’s not very difficult, I learned that you first need to figure out which direction is north and let the needle settle then rotate the compass card so the needle lines up with the north-south axis and then you can instantly see which direction is south, east, or west and set off in the direction you need to go. Great article about the magnetic compass, learned a lot. I have one question for you, Can we use a magnetic compass in ship or aeroplane as well? Magnetic compasses are influenced by any large amount of metal in the area. They don’t work well indoors or directly underneath power lines etc. So they likely wouldn’t work inside a ship or airplane. Thanks for reading and commenting!